My guess is that under the Agency model, publishers cannot allow certain features to exist on one retailer but not on another thus if they turned off the lending feature on the Kindle, then the nook lending feature disappears as well. But removing rights that existed at the time of purchase is a pretty sucky move. â— I see myself in the woman who has perhaps lost her bloom. â— I see myself in the book lover who is sometimes carried away by the romance of the fiction. â— I see myself in the daughter who is left with a widowed father. · Every Chinese knows a well-meaning mother like Mrs. Bennett who cannot rest until all her daughters are married. · What Chinese family won’t suffer an upheaval should a member do a Lydia? A Chinese father won’t be as civil as Mr. Bennett though to welcome the newlyweds back so soon after such a scandal that has brought the family shame. Real speech deals with whole-wheat crackers. That's what it's for. Dialogue deals with whole-wheat crackers only if those crackers tell a secret-‘if they reveal something about the character speaking. This is exactly right. Conversation or dialogue between the characters shouldn’t just be there to fill space, but to tell us something about the characters. I just finished reading What I Did for a Duke by Julie Anne Long and the dialogue in that book is as Stein says it should be: lyrical. "I do admire a woman of courage. And it takes courage to deflect a duke." "I've no courage at all, then," she hastened to disparage herself. "I would never dream of deflecting a duke." "Perhaps we can discuss this further during the dancing portion of the evening. You'll enjoy waltzing with me later this evening, Miss Eversea. I dance very well, despite the height." "Your modesty is as appealing as your sensitivity, Lord Moncrieffe. But perhaps a reel other than the waltz? We differ so in height I shall be speaking to your third button throughout the dance. Else you will need to look a great distance down and I will need to look a great distance up. I shouldn't like you to end the evening with an aching neck." Inevitable at your creaky, advanced age, she left eloquently, palpably unspoken. He looked down at her for a moment, head slightly cocked, as if he could hear that unworthy thought echoing in her mind. "My third button is so often a wallflower during balls I doubt it will mind your conversation overmuch." According to Richard Curtis at ereads.com, HarperCollins is inserting a moral clause in its boilerplate language. New language in the termination provision of the Harper's boilerplate gives them the right to cancel a contract if "Author's conduct evidences a lack of due regard for public conventions and morals, or if Author commits a crime or any other act that will tend to bring Author into serious contempt, and such behavior would materially damage the Work's reputation or sales." The consequences? Harper can terminate your book deal. Not only that, you'll have to repay your advance. Harper may also avail itself of "other legal remedies" against you. That’s a pretty big and vague morals’ clause. India is the third largest English book market and some people predict that it will become the major English book market in 10 years. Already, India is the third-largest English book market, according to figures from the National Book Trust of India, and it is expanding every year. K Vaitheeswaran, the chief operating officer of IndiaPlaza.com, a leading online book vendor, said: “Some of it is a function of the fact that books are now available for Rs99 (Dh8), which is a suddenly affordable price point. A whole lot of people are buying books at that price”. One would think that the increase in India readers would result in diversity of content from publishers as surely the Indian readers would want to see their values and cultural experiences reflected in these stories, even if some values and experiences are universal (see infra Chinese Jane Austen story). I thought this was a very funny article about men trying to learn more about their women based upon what their women read. A recently engaged writer hopes to be the best husband possible and decides to read the book on his fiance’s nightstand in order to gain some insight. The book was Happy Ever After by Nora Roberts. The writer enlists his groomsmen to read with him so that they can cull out what makes the perfect man. "Let's go to page 250," The Photographer said. He quoted Brown: "I can't deal with someone who can't talk to me, who can't be intimate with me except physically." The Photographer closed the book. "That may have been the closest to real life for me. I do find that my girlfriend wants to discuss everything and talk it out, and I'm more inclined to keep things in, and that's a constant friction." "Yeah, I'm a big proponent of that. I think these really deep conversations bring people closer together. I think girls especially are big advocates of that," The Executive said. Okay, I need to get that Long book now. Our definitions of “lyrical” are clearly not the same . . . Julia Ross is lyrical. Pam Rosenthal is lyrical. Long's writing is, if anything, banal (in an perfectly inoffensive and way). I’m with Isabel – what I want in my fantasy is not what I want in my reality. But that link was pretty funny… even though it said the book was chick-lit, not romance. *facepalm* And, thankfully, most of the really bad comments got thumbs-downed! I must read the JAL book. The dialogue sparkles with wit. What’s really annoying is that not only are some lendable books being removed from the feature, the icons aren’t updating on my nook. 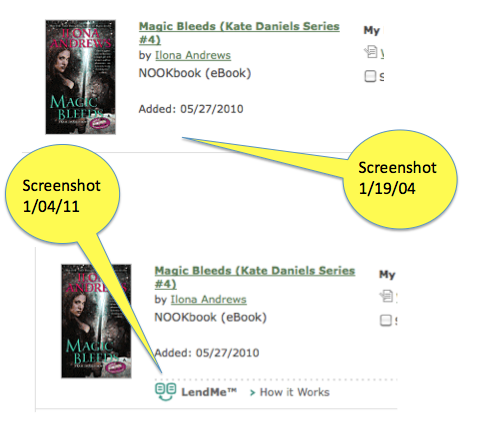 My nook stills shows certain books as lendable (until you actually invoke the LendMe feature), but online they show as not lendable. * any opt-outs are not retroactive, so anyone who purchased the title while lending was available will continue to have access to the feature. There’s a bit of upset in the comments. But at least Amazon thought about what would happen when someone who published through their DTP decided to opt out. Agency however is a horse of different color. There seemed to be a bit of upset across the board with lending groups forming. Definitely. Sad to hear that, as I just got a Nook. I haven’t yet bought a book that had Lend Me, but I would hate to think that they could take it away, considering that could be a decision-maker as to whether you would buy the book in the first place. I’d rather see the prices go down (as in $5 or less) than the increase of digital lending. That seems like a much more reasonable price range. Kerry: Haven’t read quite enough Jennifer Crusie to predict her, but clearly a gunslinger in a hat figures into it somewhere. That's a pretty big and vague morals' clause. So if an author’s conduct (conventional or no) is shown to impact sales for the better, does the author receive a bonus? It is pretty sucky to take away rights from the consumer, especially as quiet and sneaky as this is. I hate to cheer Amazon, but good for them for ensuring that won’t happen to their customers. That author morals clause is very interesting. I do wonder if they’ve been able to link Authors Behaving Badly with a decrease in sales. And if so, which ones? Other than that, the wording is very very vague, and problematical. It could lead to some serious overreach by publishers, and put authors into the position of having to defend lifestyle choices that are really nobody’s business but their own. I’m wildly curious about what prompted such a clause. Your bio mentions Kristina Bliss. Do you mean Karina Bliss (who I discovered via DA and currently adore)? The morals clause is not news to me – I recall Random House wanting to add one to their boiler plate a couple of years back now. Don’t actually know if they managed to push it through though. It was suggested at the time that their attempt followed an author published by them, (William Mayne) being convicted of child sexual assault, but I don’t know if that is actually accurate or not. The connection I mean, not the conviction – that was all too too real. I thought then that it was an overly broad overreaction, but the HarperCollins one is even worse. Other than that, the wording is very very vague, and problematical. It could lead to some serious overreach by publishers, and put authors into the position of having to defend lifestyle choices that are really nobody's business but their own. Smacks of an employer-employee relationship, doesn’t it? The real killer in the book business is that so few people read. Something like 40% of Americans haven’t read any book in the last year. In terms of hours of entertainment enjoyed by my family members per buck, unshareable 10$ books are a bad bargain compared to the cost of our internet connection, DVD rentals, and cable TV. @DS: I don’t know what to think when I see comments like this, and when I see comments in forums I belong to where authors act like “book sharing” will be the end of the world as we know it. In today’s setting, ebooks can be shared ONE TIME only – nothing like I do with paper books. Authors should be worried that their most consistent method of being recommended to new readers is being limited! Why do ebooks trigger so much fuzzy thinking? Ebooks come with rights that are different than paper books. You lease ebaooks and can’t lend them. You buy paper books but can’t carry 250 of them with you or have them zapped to you at will. Two different bundles of benefits, and if the price of one bundle of benefits isn’t acceptable to enough of us, that price will change – but if it is acceptable, then our whining is just that – ours, without support from many others.